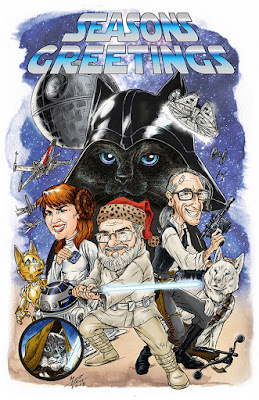 THE BRILLUSTRATOR: May The Holidays Be With You! It's the time of year when I post my annual Brill/Stockham Household Christmas card! I've been doing these themed Holiday Greetings for a number of years now--in fact, this is the 7th one! I usually try to match the theme to an important event in the year...theatrically speaking. On the 50th anniversary of Doctor Who, I did a Doctor Who themed card and I did the same the year the first Hobbit movie landed. I did Harry Potter and Big Bang Theory because those things were important to us at the respective times. This year was a no-brainer. I'd been wanting to do it for a while, but with the new movie about to burst onto screens across the world I HAD to do Star Wars!